Do you ever have the feeling that you're not getting the whole story when you read or watch American news? Do your friends think you're crazy for thinking is way? Well, it's not you. I think it might be more that too many american's have little interest in other countries (you'd think Time reader demographics would be different though) so the US cover would sell more issues. The story is in the issue in the World section. 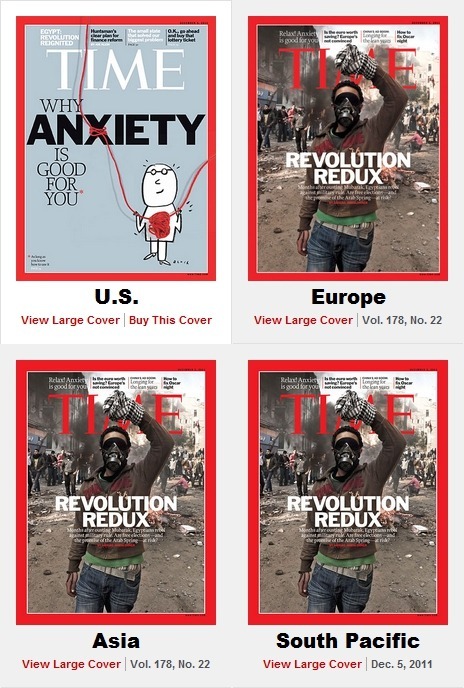 I have to say is was a bit of shock to click on Time's page and see the different covers for the different parts of the world. You might be right. It still makes me wonder. Might we have more interest if the news weren't so filtered?